Blind Stream has always drawn my attention as a place that requires more time and investigation to unlock it's secrets. We have found a few interesting things there over the years but with the many stories of what could lie hidden here we may have only scratched the surface. In George A. Thompsons book "Faded Footprints" pg. 52 he related the following story. "One of the many clues Caleb Rhoads let slip, perhaps purposely, about on e of the places where he found gold was that the trail to it passed between two knolls, one rocky and brush covered, the other bare of growth. That trail supposedly crossed a small creek and turned up a canyon which led off to the left just after those knolls were passed. No doubt other similar knolls might be found elsewhere in the mountains, but there is just such a place near the head of Blind Stream. Several hikers have come upon an ancient looking mine shaft just beyond those two knolls, only to learn later that they were unable to return to it. The shaft is said to be located in Lake Basin overlooking the South Fork of Rock Creek. It is deep, but no one knows exactly how deep, for many of the footholds cut into its vertical walls have sloughed off over the years, so that descending into it is a perilous pastime. One brave, or perhaps foolish, prospector recently told me that he had made his way down those crumbling stone steps while clinging to a rope he had tied to a tree which grew near the edge of the shaft. He descended nearly one hundred feet before he ran out of footholds, from which level a dropped stone disappeared in the black depths below, echoing as it bounced from side to side in that bottom less pit. So if you're up around the head of Blind Stream, be careful where you step; your next step could be your last one!" The "Thunderbird" symbol is located high on the ledges near the top of Lake basin facing the Blind Stream road. In Gale's book "Lost Gold of the Uintah" he states that this is "found on the high ledges near the mouth of the South Fork of Rock Creek". Another reason why you can't believe everything you read in the treasure books. While it is high on the ledges, it is nowhere near the mouth of South Fork. There is debate however as to wither this is natural or not. I plan to hike to it this summer and see if I can come up with a definite answer. These bird symbols are found directly on the road up Blind Stream. Gale again mis-states in his book "Lost Gold of the Uintah" that these are found "in Log Hollow". He also states that these are "a sacred symbol for the Utes and could either lead to the Brigham Yound Mine or Sacred Eagle Mine. Anyone who travels this road will see the mine in the photo below on your way to Lake Basin. So far I have not been able to uncover any history to this mine. It does not appear to show up on any Spanish or USGS maps. The mine is filled in just a few feet back, but according to the tailing pile the tunnel probably never extended back very far. I found this symbol on a tree that has now been cut down and removed. This symbol has several meanings. The heart can signify "Kings Mine" or "Mine of reales y placeros". The arc could mean, #1. Silver #2.Cave #3.Smelter #4. 100 or #5. Three (as you can see this is not an easy task), and the six lines most likely signify 6 varas deep, or 6 varas away. This was on the opposite side of the tree and appears to show the layout of the canyon and the route to be taken to the mine. The lines would represent how rich the treasure or mine is. 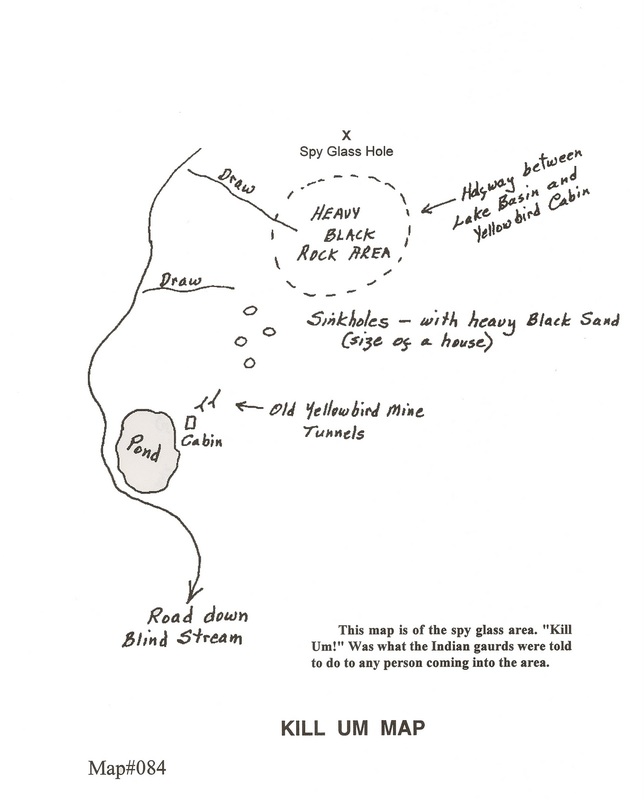 The map below was published in Gale's "Lost Gold of the Uintah" book but was not mentioned within the text. It shows the Yellow Bird mines (photos below). The mines can be located off of any USGS map. This is one of the Yellowbird mines located at the back of a large meadow. This is one of the only spots that you can see the thunderbird from down in the canyon. This entrance is just a few feet above the other. George Thompson relates the following story in his book "Faded Footprints" on pg. 52. "An Abandoned logging road leads northward from the Blind Stream road just before it crosses the summit to drop steeply down into Rock Creek Canyon. Trees with treasure symbols carved into their bark mark an old foot trail which follows that ridge up country to where high cliffs tower above. A strange looking square-cut tunnel was driven into the face of that cliff a long time ago, while near the base of the cliff there is a shaft at least one hundred feet deep. Chad Hartman of Kamas Valley discovered a prospectors mortar and pestle close by those old diggings. He's not telling exactly where he found it because there were still pieces of high grade ore in that mortar. 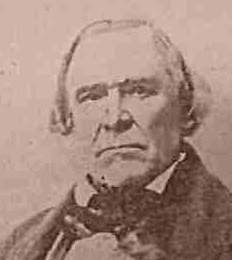 He wants to do a little more prospecting first, for that gold ore must have come from somewhere pretty close by." Someone is working a new claim along Blind Stream. Was this an old mine or a new working? The hole right now goes straight down about 10'. yep..blindstream is a pretty cool area with lots of mysteries! This hole along the Blind Stream road is a new prospect. Worked by a fellow from the Duchesne area. He and an other fellow from Hanna found a rock with a little color there a few years back. Nothing sense. !